Heat olive oil in a large frying pan. Add onions, garlic, bacon and bay leaves and cook for 5 mins until onions are softened. Add Mince and cook until browned. Add tomato puree, brown sauce, mushrooms and thyme and mix everything together well. Add wine, beef stock and honey and season to taste. Bring to the boil, then, reduce heat to low and simmer for 20 mins until liquid is reduced. Meanwhile, boil the potatoes and sweet potatoes until tender, then drain, season and mash. Heat oven to 200C. Add spring onions to the mash and mix well. 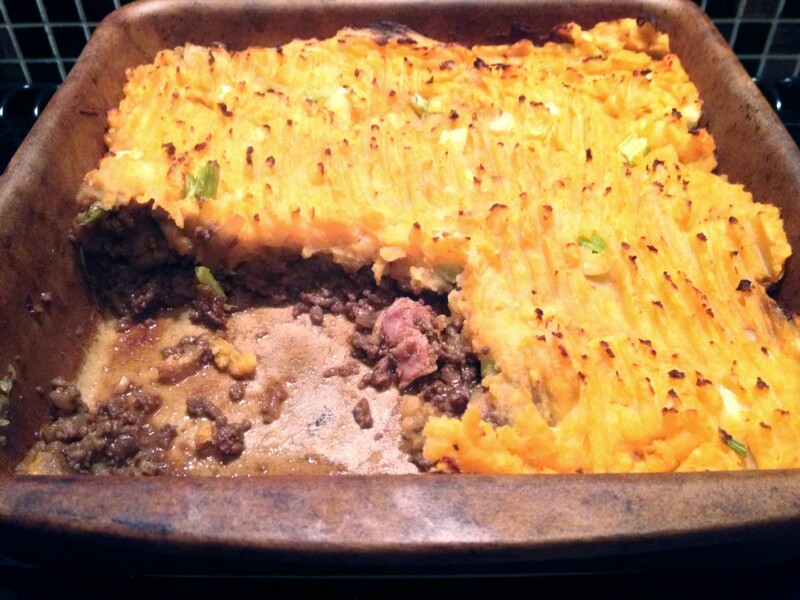 Remove bay leaves from mince and pour mince mixture into an oven dish, spreading the mash over the top. 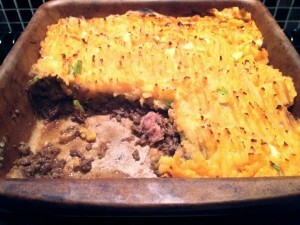 Fluff up mash with a fork and bake for 20 mins. This recipe can use either fresh mince or frozen. This is a good all round mince recipe that can be doubled in quantity and frozen, for use in many dishes. Just leave to cool after step 5 and divide into freezer bags.